In 1937, China and Japan went to war. Although Chinese forces resisted, Japan advanced farther and farther into China. The conflict brought great suffering to the Chinese people. 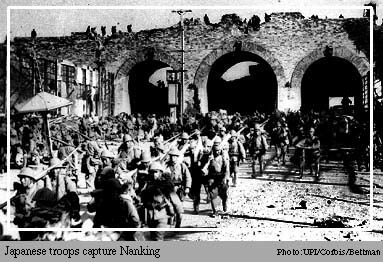 In December, Japanese troops captured the city of Nanking (Nanjing). In the month that followed, they massacred as many as 300,000 Chinese civilians. Photographs of the death and destruction in Nanking caused worldwide anger against Japan. The U.S. felt it had a special relationship with China and often acted as that nation's protector. But most Americans in the 1930s didn't want the nation to get involved in foreign wars. President Franklin Roosevelt felt he could only protest Japan's actions. Besides, Americans were more concerned with the rising tensions in Europe. There, brutal dictators like Adolf Hitler in Germany and Joseph Stalin in the Soviet Union had risen to power. In September 1939, Germany and Russia attacked Poland. France and Britain declared war in return. World War II had begun. When Germany defeated France the following year, Japan moved quickly to seize military bases in Indochina, France's Southeast Asia colony (now the nations of Vietnam, Laos, and Kampuchea). This action helped Japan continue its assault on China. It also put the U.S.-ruled Philippines within range of Japanese warplanes. President Roosevelt felt he had to act. In the summer of 1940, Roosevelt outlawed the sale of some American goods to Japan. At the same time, Congress also approved a program to build new military ships and planes. The Japanese government considered this a threat. They believed that ships especially aircraft carriers could give the U.S. and its allies an edge in any war fought in the vast Pacific Ocean.